Sung by Uma Pocha, who died last week, the tune travelled to Sri Lanka and beyond, serving as a reminder that it’s impossible to predict how sounds travel. Bombay Meri Hai is among my earliest musical memories. When I was a child, the song was always being played on Saturday Date, the pop music request show on All India Radio. But mostly, I heard the tune being performed week after week by wedding bands at the Bandra Gymkhana, opposite my grandparents’ home. Bombay Meri Hai is among the songs in the “masala” section of Catholic wedding parties – the fast-paced crescendo during which revellers wave white handkerchiefs above their heads to conjure up a long-forgotten aboriginal past as they dance to Marathi and Konkani folk tunes. Perhaps because it’s invariably performed alongside tunes like Galyan Sakli Sonyachi and Sonyachi Kavla, I’d always thought of Bombay Meri Haias a traditional Bombay Catholic tune. So I was more than a little intrigued when, deep into the graveyard shift at The Times of India in 1991, my Parsi colleague Roxanne Kavarana told me that not only did she know the man who had composed the tune, she was actually related to him. Over the next few years, I’d come to learn a little more about how Mina Kava came to compose the first-ever Indo-pop hit. 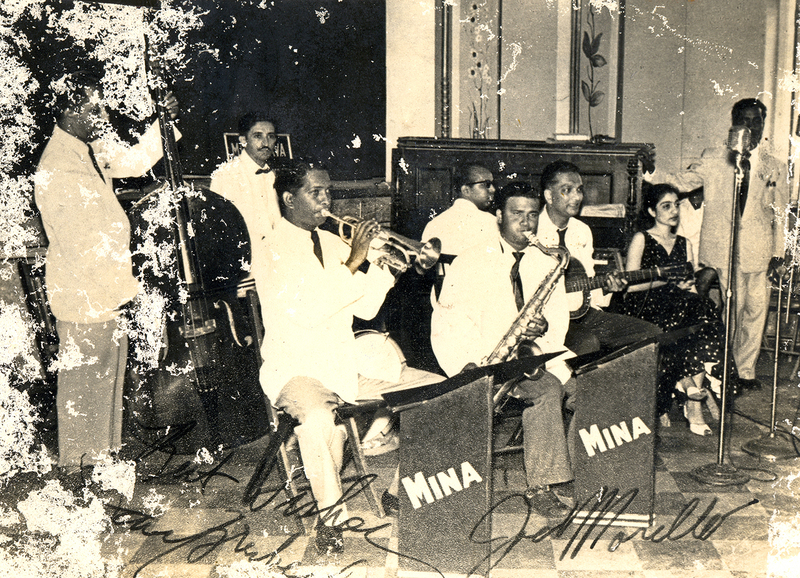 Mina Kava and the Music Makers. Kava is at the back, playing the drums.